Earn 1 point for every $1 USD of net purchases. 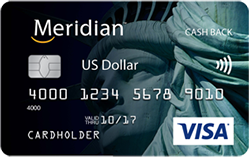 Provider: Meridian Credit Union Ltd.
With your Meridian Visa US Dollar Rewards card, you earn points just for using your card on US-dollar purchases, including items purchased when you travel to the US and when you shop online in US dollars. Meridian US Dollar Chequing account required for payment. This product is currently not available to residents of Quebec. Membership with Meridian Credit Union is a regulatory requirement to hold a Meridian Visa Credit Card. You are not required to have other Meridian Credit Union products. For more information about Meridian visit www.meridiancu.ca/about. Please note that Ratehub.ca will be unable to confirm eligibility for this promotion until membership with Meridian Credit Union is completed.